Waterproof has released a couple of REALLY nice drysuits, telescopic, front entry, etc. A closed circuit diving system by KISS Rebreathers that is a game changer. The GEM is a gas extender (technically semi-closed circuit) that can extend a tank of gas by 3 times while utilizing a Micropore ExtendAIR filter for ease of use – no manually filling your can with sord. Here is a picture I took of the unit. Liquivision shocked everyone by releasing a OC/CC TRIMIX computer with color OLED and a user replaceable battery for $999 -- the Liquivision Xeo. The CC side of this is fixed set point but what a great backup for the X1 or if you are never going closed circuit this is the perfect computer. The Liquivision Xeo is at least half the size of the brick computers and packs more features with a smaller price tag than any other computer out there. 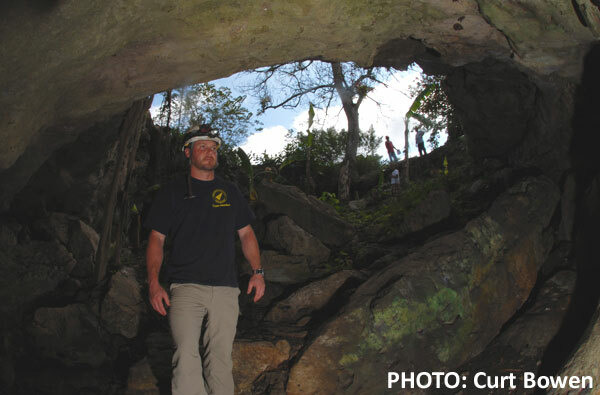 We are starting to narrow down the mission and goals for the ADM Exploration Foundation 2011 Yucatan Cave Exploration. It is coming together nicely and I suspect a lot of fellow cave explorers will be amazed at what we come up with! We have assembled a diverse team with great skills and we have high expectations. Stay tuned! So I have been going through some life changes and have been thinking a lot (I know, not smart if you are a cave diver). Recently, I was compelled to go dive Eagle’s Nest and my buddy bailed on me at the last minute. Since I was already close to the Nest, I decided I would do a solo dive. I know that many people don’t like solo diving and I am not a practitioner of it. We have all been in solo "situations" both in caves as well as in open water. 50-100’ away from a buddy is a long way to swim if you are out of gas or have a gas casualty. I am usually diving sidemount (both open circuit as well as on my KISS Classic rebreather) so my I feel I have gas management covered. If I were diving backmount, I would have employed a "buddy bottle" for safety. Many know that neither the NACD nor the NSS/CDS condone or condemn the practice of diving solo in caves. I am not here to lobby for or against but rather provide my experience. The first thing I noticed when I arrived at the Nest is that I was not feeling like I was pressed for time. This is usually the case as I end up gabbing too much and everyone else is ready before I am. I also noticed how much attention I paid to my gear; more so than usual (I will remember that). I analyzed my gases on site (again) and went through all of my gear meticulously. After taking my bottles to the water I suited up in my drysuit and Armadillo. I went to the water and sat; shining for alligators. Honestly, gators were my ONLY concern for the dive – if a bottle has an issue, I have another – one light fails, I have 3 more – lose my way, I carried an exploration reel. For this dive the only thing I took with me out of norm was an extra light and an exploration reel. The reel I took with the intent of using it for safety if needed. OK, no red eyes on the water. Time to go diving! I kitted up slowly and deliberately; it felt great. I entered the crap-viz, pea soup basin and made my way to the "log" to drop off my 02. I did another set of bubble checks on my bottles and down the shaft I went. After clipping my 50/20 mix to the line at 75’ I dropped to about 10’ above the mound. I was surprised how lucid this dive was. I noticed things I never had before. I was completely engulfed by the dive. I had no reason to rush and no one else to worry about! My dive plan was to go upstream a bit (gas constrained), then go back around the mound and go downstream to the Lockwood Tunnel jump. Throughout the dive I was surprised how much better my breathing rate was; I guess I really was relaxed. I completed the dive without incident and started my long deco out. That is a major concern that should be given CAREFUL consideration – deco! If you have an issue and no one is topside waiting for you, it could mean some serious complications. Although I was completely alone I did use a common dry caving practice of leaving a callout. I called my buddy and let him know when he should hear from me. This would be akin to a flight plan if flying or a float plan if boating. I am still not an advocate for solo diving and I don’t know if I will ever dive Eagle’s Nest by myself again. For one, I would have rather had someone with me in the basin looking for that monster gator that never appeared; oh how I knew he was out there lurking, watching me. Waiting for the opportunity to come over and scare the hell out of me. However, I am pleased with my dive and it gave me the catharsis I desperately needed. As always, if you see something on the site you would like added or changed, please feel free to let me know.